In this talk with our Good News readers I want to say something about the many letters we have received from those who have read the exciting book The Wonderful World Tomorrow — What It Will Be Like since it was first published nearly 17 years ago. All but a few — from more than 1.6 million books mailed out — have been enthusiastic, elated, inspired to know what a WONDERFUL world is soon to be ours. I wish ALL OF YOU could realize that this wonderful coming world IS REAL — and most of you will be in it, I hope, as one of its changed IMmortals. It's not only REAL, it is coming SOON — possibly (I do not set dates) in less than 10 years! Yes, very possibly that soon! But what I am most concerned about is WHAT IT MEANS TO YOU— as an individual! Each of you! I wish all of our readers could think — as one wrote me wondering what YOU will be doing, then! I wish all our readers could be reminded, at this point, of that very first of the LAWS OF SUCCESS! There are seven laws that will produce success. The very first one is to have the RIGHT GOAL — to be fired with ambition to achieve that goal — to keep that goal constantly uppermost in your mind! Have a definite, inspiring PURPOSE in life. Realize, as Winston Churchill said, there is a PURPOSE being worked out here below! Mankind was placed on this earth FOR A PURPOSE. That means YOU, as an individual, were born and given the breath of life for a PURPOSE! In this world's colleges and universities they teach nothing about that purpose. They know nothing of the real MEANING of life. They leave students without a goal. They don't know where they are going or whether they are going anyplace. But the all-intelligent, all-knowing Creator — who designed the human mind and body, created the human race and supplies the air, water and food to sustain it — had a PURPOSE! And, through the apostle Paul, He reveals to us that GOAL — in Paul's words, that "I may attain to the RESURRECTION" and, further, "One thing I do, forgetting those things which are behind and reaching forward to those things which are ahead, I press toward the GOAL for the prize of the upward call of God in Christ Jesus" (Phil. 3:11, 13-14). The GOAL the PRIZE — the MARK toward which Paul pressed forward is THE RESURRECTION TO IMmortality, in the Kingdom of God! In this important book we have tried to paint in simple words — as revealed in the Bible the WONDERFUL world that this Kingdom of converted, changed IMmortals, under Christ, will produce. But is BEING THERE, as a changed, immortal person, YOUR goal? Is that one overriding LIFE'S OBJECTIVE constantly before your eyes — constantly dominating your thoughts? 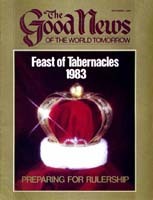 Many have written to tell me how exciting — how interesting and inspiring — it is to see just WHAT such patriarchs and prophets and men of God as Abraham, Joseph, Job, Daniel, Moses and others might be doing — how they will be brought back to life, immortal, in glorified POWER — and the high executive positions in the new WORLD GOVERNMENT they will occupy. Interesting? Exciting? WONDERFUL? Yes, I should say it is! But, as I said above, I wish all of YOU were terribly concerned by asking yourselves where YOU will be — what you will be doing then! I don't mean that you may decide for yourselves what precise position may be assigned to You. Yet, in general, I can tell you what position will be assigned you! It will be the position you are training for, qualifying for, RIGHT NOW — in this life! WHY will Abraham, David, the apostles Peter and Paul, be assigned the positions either directly named — or at least indicated — in the Bible? Simply because they prepared for and qualified for those positions DURING THEIR MORTAL LIVES! You — if you have been called to conversion now — are being JUDGED for your future position in God's Kingdom right now! Few understand this — I know. But see if I can make it plain enough that at least some of our readers may UNDERSTAND. A number of "JUDGMENTS" are revealed in the Bible. Most people get all mixed up and confused by such theological terms as "judgments," "covenants," etc. Understand, first, being "saved" — that is, being born into the Kingdom of God — given God's GIFT of eternal life — is altogether by GRACE, as God's free GIFT. You can't earn it! I have ALWAYS taught that! In spite of the false accusations of persecutors, who try to make you believe I teach "salvation by WORKS" (and they know better! ), I have NEVER taught that. I do not believe that! I have always taught that salvation — what religious people call "being saved" — inheriting eternal life — being born into the Kingdom of God — just getting there — comes ONLY by GRACE (which means undeserved pardon) and as God's FREE GIFT. You CAN'T earn it! All your OBEDIENCE — your good WORKS — won't buy it! But — and here is where the persecutors are in confusion — you shall be REWARDED with whatever OFFICE you shall be placed in according to your WORKS! Check for yourself. Don't believe me because I say it — check for yourself. For those who would like a more detailed and technical exposition of this vital principle, write for a FREE booklet, What Will You Be Doing in the Next Life? But, when the glorified Jesus Christ returns to earth, in all the supreme POWER and GLORY of God, as KING of kings to rule all nations, He will then assign the positions in His government — the "reward" — to those who already — then — "ARE SAVED," to those who have, through grace, received God's GIFT of eternal life — then already made IMMORTAL! These shall have been resurrected to immortality and have risen to meet Him in the air, as He is returning. Now notice: Jesus says, "And behold, I am coming quickly, and My reward is with Me, to give to every one according to his work" (Rev. 22:12). Notice the parable of the pounds: When Jesus returns, having been coronated KING of kings, He will call to Him those He had given "the money" that is, His Spirit and salvation. The one who, in this mortal life, had gained "10 pounds" is made mayor over 10 cities. The one who gained, in his Christian life in this time, five pounds is made mayor ruling over five cities. He qualified for only half as much, during this mortal life, so his REWARD in the Kingdom — the POSITION to which he is assigned — is only half as much. Notice this picture of Christ's coming, and establishing of the Kingdom of God over the nations: "Then the seventh angel sounded: And there were loud voices in heaven, saying, `The kingdoms of this world have become the kingdoms of our Lord and of His Christ, and He shall reign forever … The nations were angry, and Your wrath has come, and the time of the dead, that they should be judged, and that You should reward Your servants the prophets and the saints' " (Rev. 11:15-18). "And I saw the dead, small and great, standing before God [in a resurrection], and books were opened. And another book was opened, which is the Book of Life. And the dead were judged according to their works, by the things which were written in the books" (Rev. 20:12). Peter taught that God JUDGES (not "saves") according to WORKS: "The Father, who without partiality judges according to each one's work" (I Pet. 1:17). Paul taught that God "will render to each one according to his deeds" (Rom. 2:6). Jesus said, plainly, "No one can come to Me unless it has been granted to him by My Father" (John 6:65). And again, "No one can come to Me unless the Father who sent Me draws him; and I will raise him up at the last day" (verse 44). But, to you whom God has called at this time — to you who have repented, believed, received God's Holy Spirit and thus been converted — YOU ARE BEING JUDGED RIGHT NOW (I Pet.4:17). And if you say, "I'm already saved, and there are no works to salvation," and then you fail to go on overcoming and growing spiritually(see II Peter 3:18), you not only will BE JUDGED by your lack of spiritual works to qualify for a higher office in God's Kingdom but, far worse, you may be in the position of the servant from whom (parable of the "pounds" — Luke 19, quoted above) Jesus took away the very salvation he thought he had! It takes a LIVING faith to save! STUDY God's Word daily! Realize you must learn to live by its every word! So LIVE BY IT! And pray earnestly, daily and OFTEN! Put into practice in your life what God teaches you in His Word! And get your heart in HIS WORK! Pray for it!